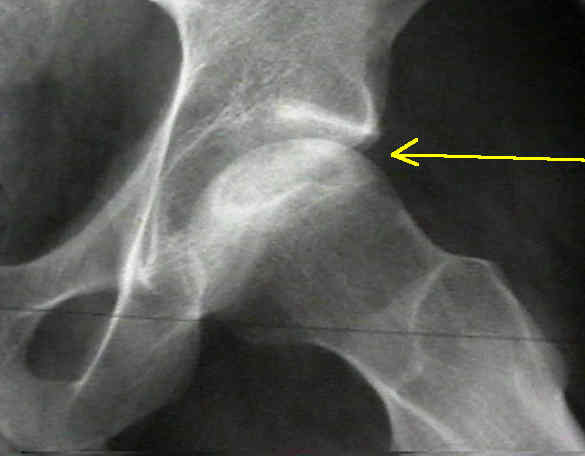 Avascular necrosis of the femoral head is bone death thought to arise from interruption of the blood supply. Progression of the disease is characterized by flattening of the femoral head with eventual collapse of the hip joint. Stem cell therapy is a non surgical option in the treatment of AVN of the femoral head. 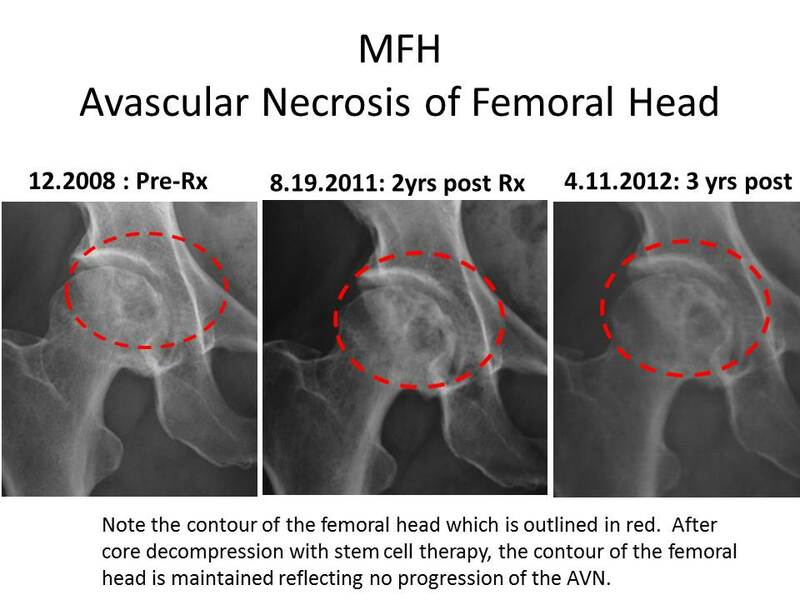 MFH is a 50y/o active female initially evaluated at the Centeno-Schultz Clinic with ARCO stage 2 AVN of the femoral head. On 4.2009 she underwent core decompression where bone marrow derived stem cells were injected directly into the area of necrosis. Clinically patient has done extremely well as reflected in her 5 year follow up questionnaire which she permitted us to share. Her hip x-rays demonstrate successful treatment of AVN with Regenexx treatment. 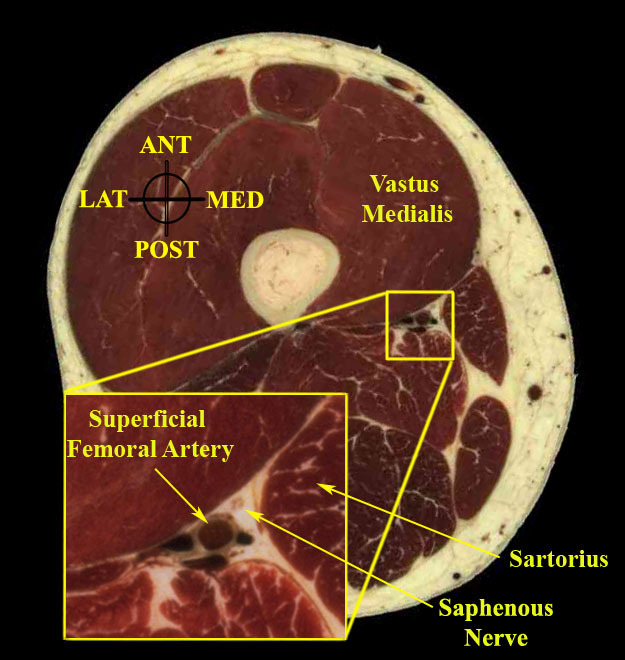 Note that the contour of the femoral head has not changed, flattened or collapsed. 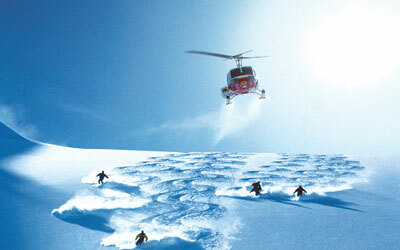 Skiing the trees in Aspen. These are activities that BC enjoyed after undergoing specialized platelet epidural injection at the Centeno-Schultz Clinic. Regenexx PL-Disc utilizes a supercharged collection of platelet growth factors that are injected under x-ray around the irritated nerve roots and lumbar disc. Regenexx PL-Disc is differs from traditional platelet rich plasma (PRP) as it created by a cell biologist, has reduced white and red cell contamination and higher concentration of platelet growth factors. High steroid epidural steroid injections have significant side-effects and platelet injections are a viable alternative as discussed in video below. CB is 39 y/o outdoor enthusiast who presented to the Centeno-Schultz Clinic with a 20 year history of right leg pain that was progressive in nature originating in the buttock extending down to the lateral aspect of the foot. Aggravating factors included coughing, sneezing and prolonged sitting. Treatment to date had been extensive and included heat, ice, physical therapy, massage, chiropractic care and high dose epidural steroid injections. Patient had undergone a L4/5 laminectomy and decompression due to disc herniation in 1991. MRI was significant for facet hypertrophy and right-sided disc bulge at L4/5 with impingement of the L4 nerve root. CB underwent two x-ray guided injections of the right L3-S1 facets and the right L4 and L5 nerve roots and epidural space with Regenexx PL-M over 2 months. 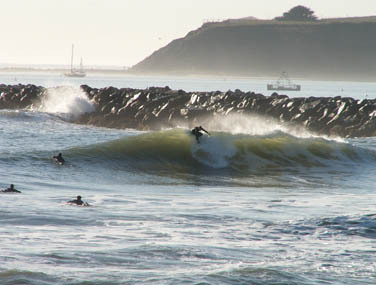 These treatments allowed him to engage in a 14 day 3 state epic trip. I saw CB in clinic post trip and he continued to feel great with no leg pain or restrictions. At the Centeno-Schultz Clinic we approach pain and dysfunction in a systematic fashion which is outlined in Ortho 2.0. We employ the acronym SANS: symmetry, articulation, neurologic and stability. This approach can be utilized for any joint. 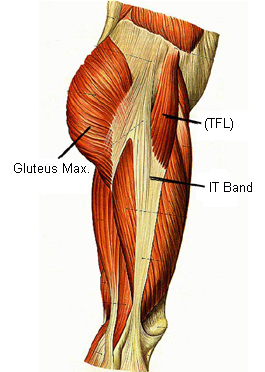 The iliotibial band (ITB) is a fibrous band that extends from the hip (ilium) to the knee (tibia). It is a critical in the stability of the hip and pelvis. 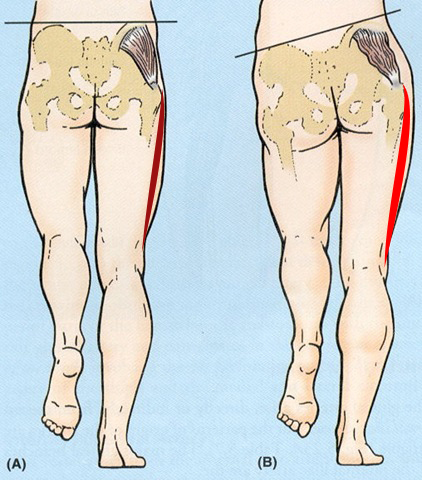 There are both anterior and posterior forces on the ITB. Posteriorly it connects with the gluteus medius muscle which when contracted pulls the ITB posteriorly. Anteriorly the ITB connects with the tensor fasciae latae muscle which when contracted pulls the ITB anteriorly. Biomechanics of ITB: Supports and stabilizes the hip and pelvis when the opposite foot is suspended and off the floor such as when we are walking. Lumbar spinal nerves provide essential information to the gluteus medius, tensor fasciae latae and other muscles that support the ITB. Irritation or compression of lumbar nerves can result in a reduction in the nerve signal to the muscles and ensuing weakness. This weakness can be witnessed on physical examination when the patient is asked to stand on one leg and the pelvis shifts. Weakness in the ITB compromises the stability of the pelvis and hip with resultant shift of the pelvis as illustrated below. 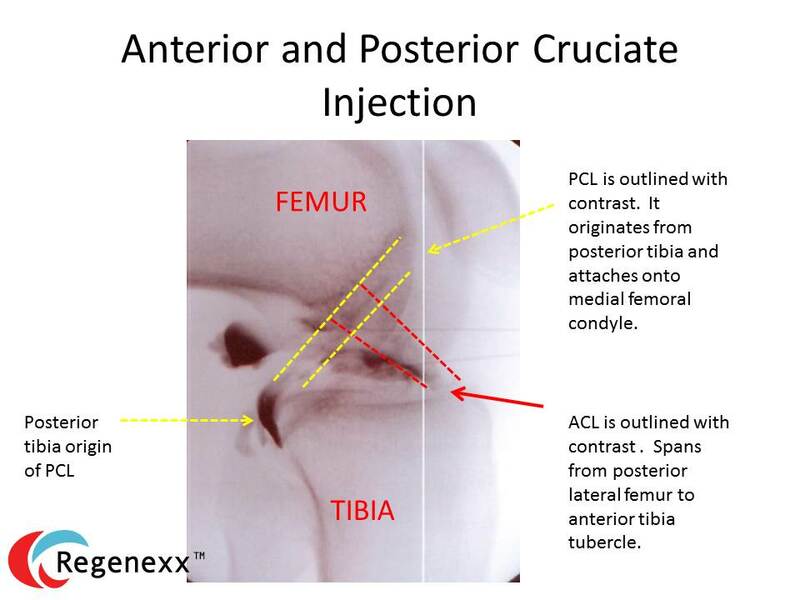 An excellent analysis and summary of the iliotibial band is presented below by Dr. Centeno. Avascular necrosis (AVN) is bone death thought to arise from interruption of the blood supply. 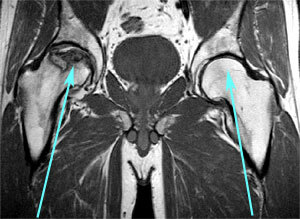 The MRI below illustrates bone death (AVN) in the left hip characterized by irregular shape of the femoral head and dark black bone. This is in contrast to the normal hip on the right. Stem cell therapy is a non surgical option in the treatment of AVN of femoral head. Core decompression is a x-ray guided procedure that places bone marrow derived stem cells directly into the area of necrosis. Hernigou demonstrated the clinical efficacy of core decompression with bone marrow derived cells in the treatment of hip avascular necrosis. 534 patients with early stages of AVN were treated and best clinical outccomes were noted in patients without collapse of the femoral head (stage 3). Prior blog posts have discussed clincial successes. Common causes of AVN include excessive alcohol, steroid use, trauma, vascular compression and chemotherapy. Classical presentation involves the head of the femur, neck and talus and scaphoid. Typically affects individuals between 30 and 50 years of age. The two most commonly used classification system used are the Ficat andArlet Staging and ARCO staging. A cardinal finding is the crescent sign which is seen on x-ray and refers to a linear area of subchondral lucency most frequently in the anterolateral aspect of the proximal femoral head. The sign indicates a high likelihood of collapse. The crescent sign is best seen in frog leg position (abduction). Prognosis depends upon severity of the bone death. Non surgical options utilizing bone marrow derived stem cells are available for patients with avascular necrosis at the Centeno-Schultz Clinic. At the Centeno-Schultz Clinic we understand the limitations, physical and emotional drain associated with pain. 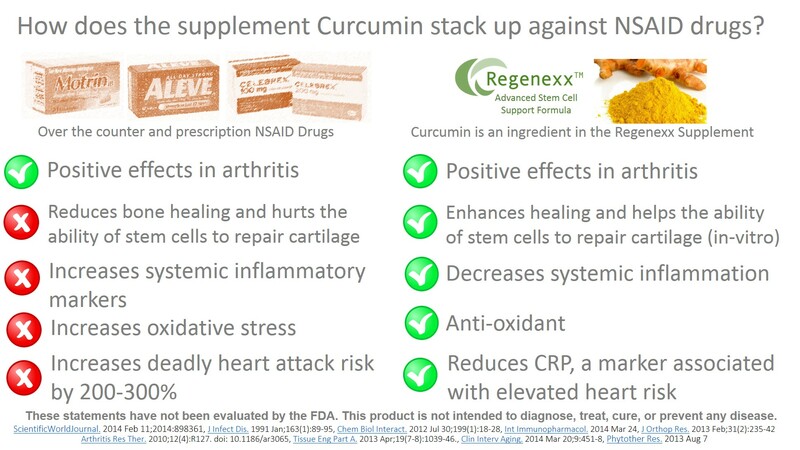 Curcumin is an active ingredient in the Regenexx Advanced Stem Cell Support Formula. It is an innovative formula of nutritional supplements that helps maintain and support normal joint health and functioning. In Regenexx laboratory studies, the supplements within the formula helped to maintain the health of the cell environment and provide support for the joint’s natural cartilage growth (chondrogenesis) process. 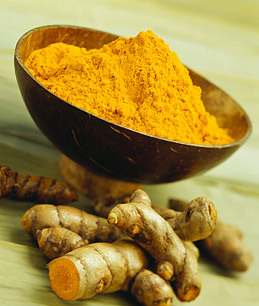 Curcumin an extract from the Indian spice tumeric. Research has shown curcumin to modulate inflammation. Is Curcumin as effective a Ibuprofen? Kuptniratsaikul et al recently compared the efficacy and safety of Curcumin with Ibuprofen in patients with knee osteoarthritis. In a multicenter study, 367 patients with knee osteoarthritis were randomized to receive 1,200 mg/day of ibuprofen or Curcuman extracts 1500mg/day for 4 weeks. Curcumin was as effective as Ibuprofen in improving pain and function in patients with knee osteoarthritis. While the number of adverse events was not different between the groups, there was a higher number of abdominal pain/discomfort in the ibuprofen group. The chart below outlines the key differences. NSAID have significant side effects which include reduced bone healing, increases in systematic inflammatory markers, increases in oxidative stress and increases in deadly heart attack risk by 200-300%. Know the risks and natural alternatives for management and treatment of knee arthritis pain. At the Centeno-Schultz Clinic we acknowledge that there can be many causes of knee pain. In our online book, Ortho 2.0 a systematic approach is discussed: SANS. Irritation or dysfunction of the saphenous nerve can be cause of knee pain. The saphenous nerve is a pure sensory nerve compromised of fibers from L3 and L4. 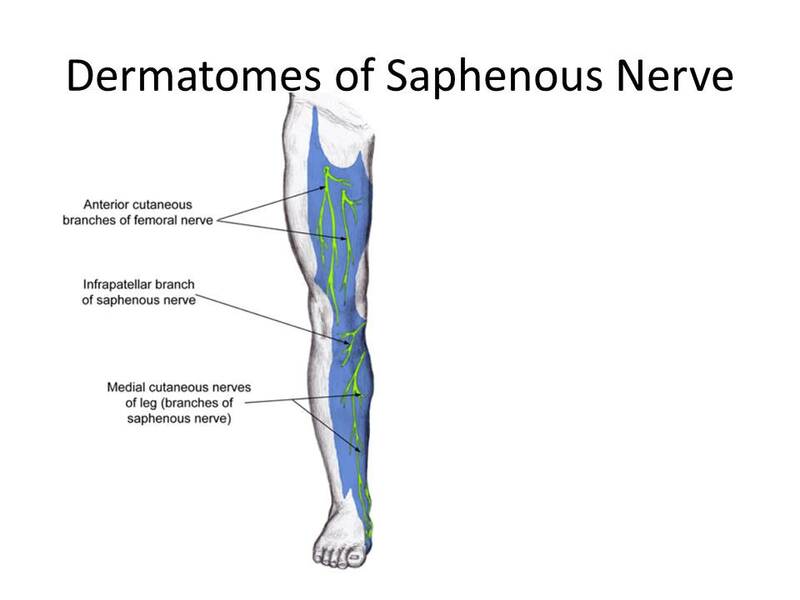 The saphenous nerve is the longest branch of the femoral nerve. Above the knee joint the infrapatellar branch arises whereas below the knee the medial crural cutaneous branch provide sensation to the front and medial aspect of the knee. A common site of entrapment is adductor (Hunter’s) canal which is an aponeurotic tunnel in the middle third of the thigh. Adductor canal contains femoral artery, femoral vein and branches of the femoral nerve which include the saphenous nerve. A systematic approach with diagnostic tools that include MSK ultrasound ensure maximal patient outcomes. 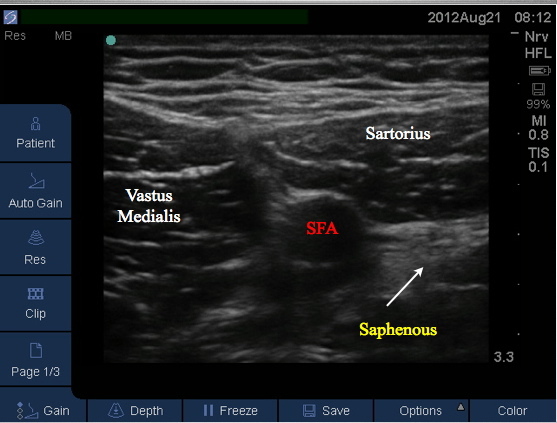 Treatment options of saphenous nerve irritation/entrapment include MSK ultrasound guided hydrodissection with platelet growth factors.